I first heard the term “mindfulness” from a psychologist I was seeing in the hope of improving my concentration and, in turn, my job performance, which had declined sharply over the previous several months. My cluelessness can be inferred from my asking a close friend, a practicing Buddhist, whether he was familiar with the concept. I might as well have asked my friend, who has closely followed the Boston Red Sox since the late 1970s, if he knew anything about baseball. Mindfulness, I suppose, also can be described as the antonym of absent-mindedness, a state of being I am all too well acquainted with. This is not a recent phenomenon. It predates my cognitive decline by many decades. In elementary school I was notorious for the consistency I maintained in leaving my coat on the playground. The number of baseball caps I have lost over the years could outfit a major league roster. Back in the late nineties, the supermarket that I shopped at was in the practice of placing groceries on a conveyor belt in front of the store. Motorists would pull up and clerks would load the groceries into each car. Once, soon after I learned I had been hired for a new job, representing a major increase in salary over what I was accustomed to as an adjunct-faculty member, I had so many things on my mind – Will I need to purchase a more reliable car? Am I going to need to buy a suit? Do I really want to work at a place where I need to wear a suit? Do I even want to work full-time? – that I left behind my eighty dollars’ worth of groceries on the conveyor belt. My relationship with my raisin became increasingly intimate. I was allowed to place the raisin on my tongue. I let it lie there for some time, until I was told to hold the raisin gently between my molars, to fully appreciate its texture. Consummation was postponed. But not for long. The molars did their work. The sensation was intense. How often do we wolf down our food, at home, at our desks, in our cars, while barely noticing what is passing down our gullets? What subtle pleasures are we neglecting? This week I am writing about a short story by the Seattle-area writer David Guterson, best-known for his novel Snow Falling on Cedars, about the internment of Japanese residents in Puget Sound during World War II. About a year ago, I came across Guterson’s story collection Problems with People. At the time, the story that most resonated with me was one in which a father grieved over having encouraged his son to work as a fisherman in Alaska. It was very similar to a story that I had published more than a decade ago. But it was not Guterson’s story about a young man who drowns in Dixon Entrance, just north of British Columbia, that most impressed me. It was a story about a man diagnosed with Alzheimer’s. He went in for tests that revealed changes in his frontal lobes. A battery of interviews yielded the conclusion that his short-term memory had declined. His ability to act serially was compromised, and he’d lost what a doctor called “executive function.” All of this within three months of retiring—not what he’d had in mind. There is no wringing of hands about the diagnosis. The man is stoically unhappy, even when – or maybe because of – going on a cruise with his wife. He pines for his freedom. He resents his wife’s condescending comments. It is not until he gets a call from his youngest son, whom he hasn’t seen in years, that the old man’s spirits rise. The son, a former global backpacker and war correspondent, is working on an oral history project about people who took part in the civil rights movement in Alabama. The father is taken aback by his son’s invitation to help him with the project, and he wonders whether one of his other sons has put him up to it. He didn’t think he needed their concern or assistance. He was a man who still knew how to operate in the world. So what was wrong with everybody? Talking about him as if he was a baby, talking to his face that way, talking to him as if he weren’t there, about his driving, clothing, eating habits, etc. This, of course, is the wrong thing to say to a man who has just been diagnosed with Alzheimer’s. It only solidifies his resolve to demonstrate that he is still a competent person. But in the post-9/11 era, airports are curious places. People are herded into lines cattle-style, and then asked to remove their shoes, lest some unhinged mind has a dream of copycatting the shoe bomber, Richard Reid, a true failure, and yet a failure so colossal that each of us, now and forever, must remove our shoes to be allowed to board a plane. His son waved and receded, and then he was alone. He waited his turn, but when his turn came, he’d failed to understand about his shoes and belt and had to wrestle, in a time crunch, with these wardrobe items. After some trouble with his shoelaces (he’d double-knotted that morning, at his wife’s insistence), he was told to empty his pockets into what looked like a dog bowl, and in so doing spilled change. A lucky thing next—in a switch from what was normal, he made it through the metal detector without a hitch. Then back to normal: the X-ray machine picked out his razors, so he had to wait while a security guard unpacked and examined everything in his bag. In the end, he was admonished for his razors, and lost his razors, and had to hear the rule about razors, which he already knew but had hoped to circumvent, and now feigned surprise at. Things continue to go badly. He can’t find his pills. He ends up at the wrong gate. He learns that he is in the wrong terminal. He gets on the airport tram, which at the Seattle-Tacoma airport, makes announcements in several Asian languages, causing the former lawyer to miss hearing the announcement in English. It is like a bad dream derived from Kafka. He is soon escorted out of the airport terminal. My intent this week was to write about insomnia, a subject I was intimate with in my twenties. My plan was to reflect on those nights, decades ago, when I would toss and turn in bed sometimes until dawn, waiting for my mind to wind down. The topic is of interest to me because, since I was diagnosed with Alzheimer’s in June, I’ve been wondering to what extent the disease is affecting my sleep. Rather than struggling to fall asleep at night, I find myself waking up earlier – sometimes much earlier – than I wish. But that’s a topic for some other unwelcome dawn. Around 2 a.m. this past Tuesday, a couple of hours after I went to sleep, I woke up in a sweat. The disruption was forceful enough that falling back to sleep anytime soon seemed remote. Instead, I went downstairs to my dining room, where I located a notepad and began drafting this blogpost. This was not the first time that medication for Alzheimer’s has disrupted my peace. One of the first times I took a dose of Donepezil (better known by the brand name Aricept), I dreamt about Aaron Hernandez, the former New England Patriots star now serving a life sentence for murder. He was chasing me with what I believe was an axe. That nightmare prompted me to read more carefully the seemingly endless menu of Donepezil’s potential side effects, ranging from nausea and vomiting to hallucinations. I suppose that I should count myself lucky in that the only effect I am experiencing regularly is some modest pain centered in my lowest vertabra, a consequence of an arthritic condition that dates back to my late thirties. But I am still in the process of fully understanding Alzheimer’s as a disease. My earliest symptom appeared three years ago, after my wife and I dropped off our son at college in Washington, D.C. On the long drive back to Boston I noticed a thought forming in my head that I couldn’t quite grasp. It was as if I were trying to retrieve information from a hard drive manufactured in the early nineties. That machine would sometimes emit a grinding sound when calling forth a file. What I glimpsed was a phantom of a thought, empty of meaning. It was another year before I realized that something was seriously wrong. Until then I could attribute a relatively modest decline in job performance to nothing more than burn-out after eight years in the same job. But in the late summer and early fall in 2013, my problems became more severe. That December my gerontologist (how many people in their early fifties are assigned to gerontologists?) noted that I was at risk of developing dementia. The problem facing all of us in the early stage of early-onset Alzheimer’s is that there is no drug on the market that can substantially slow the disease’s progress. Pfizer, the maker of Aricept, makes clear on its website that the drug treats Alzheimer’s symptoms, such as poor short-term memory, rather than the underlying disease itself. A magic bullet it is not. That could change, of course, just as things changed in the early 1990s for people who were HIV-positive, saving the lives of Magic Johnson and countless others. Do I think this sea change will come anytime soon? No. But there is consolation in knowing that one’s disease tends to progress fairly slowly. There remains much time for me to observe the world. As I traverse the streets and walkways of Somerville, my home for most of the past thirty years, my gaze lingers on a small child squeezing a parent’s hand, a big dog on a leash dragging its owner, petunias blooming in a crack of the city sidewalk. No one has asked me this yet, but I’ve been wondering how I would respond to the question, Do you feel cheated? On the face of things, maybe I should. We live in an era when many people are living into their eighties and beyond. As recently as the 1930s, Americans were expected to die in their mid-sixties. This was a key part of the original plan for Social Security. By making sixty-two the minimum age, policymakers could confidently predict that the average recipient would live for just three more years. These days, life expectancy in America is a month or two short of eighty. In my extended family, I had a great-grandfather, Frank Christie, who lived almost to 100. He was born in 1876 and died when I was in my early teens. His wife Alma lived deep into her eighties. My maternal grandmother, Evelyn Christie, lived to seventy-nine. My dad, thanks in part to what we would now call the “Mediterranean Diet,” died in 2004, just shy of eighty-seven. My mother, a recipient of good genes descended from Frank and Alma Christie, turned eighty-seven this past March. She spends her time in an assisted-living home, where she continues to paint watercolors, read, and enjoy herself. Did I assume, pre-diagnosis, that I too would reach my eighties? I didn’t take it for granted, but it seemed probable. A few months earlier, I’d read an article in The Atlantic Monthly titled “Why I Hope to Die at 75.” (The title was not literally accurate. As the middle-aged writer explained, his intention is that once he reaches seventy-five, he will forgo medical treatment that would extend his life.) I asked myself at that time if I too would be willing make such a vow. I wasn’t sure. I was still confident that I would live to be seventy-five. Family members and friends have commented on how quickly after being diagnosed with Alzheimer’s I conceived the idea of this blog. In my mind, I had no choice. Writing has governed my life, in one way or another, since I started college. It helps me make sense of the world. But there is another, more important, reason why I feel relatively at peace. All my life, I’ve felt the love of others. I grew up in a home with two steady and fair-minded parents, along with a big brother that I often wrestled with on the living room rug in front of our fireplace, until one of our parents would shout, “Look out for the mantel!” And it wasn’t just my family that gave me love. I grew up in a wonderful city in northwest Washington at a time when kids (boys, at least) were free to roam widely on their own. As an adult, I have never been short on friends. Most important, I have a loving and capable wife. But there is, of course, a very high probability that I will leave my wife a widow. And this is where my calculus becomes more complicated. I am fortunate that my youngest child is thirteen, and my son twenty-one, an adult in every sense. 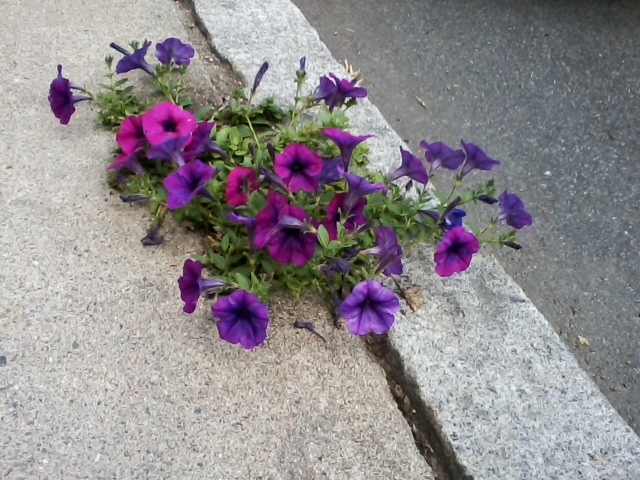 But there are times when the weight of my diagnosis oppresses me. This is almost always as night, for as Ernest Hemingway pointed out in his painfully beautiful novel The Sun Also Rises, “It is awfully easy to be hard-boiled about everything in the daytime, but at night it is another thing.” The notion of leaving behind my loved ones has the power to rupture sleep. This is the first installment in what I conceive as a weekly blog. 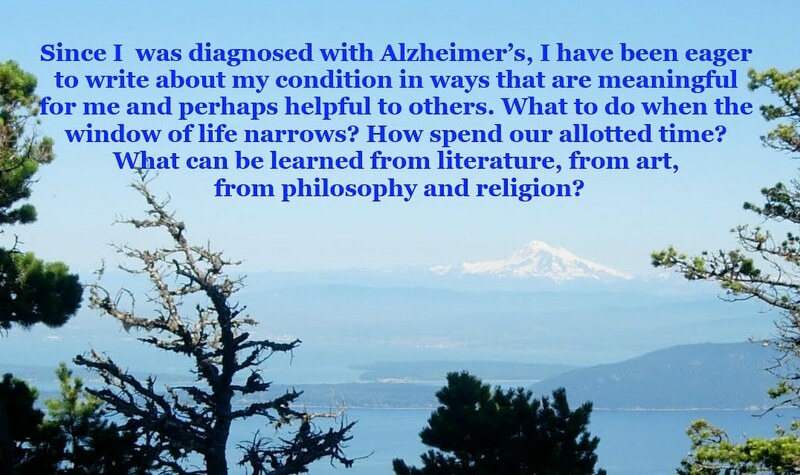 While the text placed just above the image of Mount Baker and the San Juan Islands is designed to give a taste of my thematic concerns, I will also be writing about Alzheimer’s research and my personal struggle with the disease.